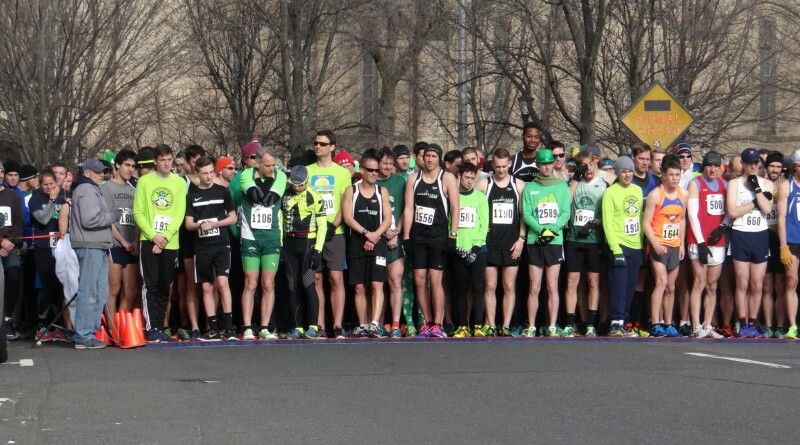 Six teams earned victories on Sunday at the PLR ShamRock ‘n Roll 5k in New Haven as the USATF-CT Road Racing Grand Prix kicked off the 2016 season. SoundRunner racing, led by women’s individual runner-up Jackie Baumgartner in 18:01, took the women’s open crown, all three of the SoundRunner scorers broke 19 as Baumgartner was accompanied by Kristina Miner’s 18:19 and Jaclyn Sullivan’s 18:58. The SoundRunner (55:18) ladies out paced runner-up New Haven Road Runners by just over two minutes (57:25) and Manchester Running Company, the race for second was decided by just 12 seconds. Milford Road Runners were fourth and Mohegan Striders, led by women’s winner Rebecca Snelson finished 5th. Total Training, new to the USATF-CT Circuit in 2016 took the women’s masters crown by just 13 seconds over Mohegan Striders while Milford Road Runners edged Manchester Running Company by 27 seconds for third. Mohegan Striders earned the win in the women’s grandmasters division while Milford Road Runners took the victory in the women’s seniors. On the men’s side, SoundRunner took the win as all five runners ran under 16:35, led by Nick Migani’s fourth place finish. Manchester Running Company was just under two minutes back while New Haven Road Runners, led by race winner Thomas Porter (15:32) was third, edging Mohegan by just 9 seconds to earn the prize money. Mohegan earned redemption in the master’s division, defeating New Haven by 95 seconds, Housatonic Road Runners won the grandmaster’s race by just 27 seconds over Milford and Hartford Track Club was the winner of the senior division. Be sure to register in advance for the next race on the Grand Prix, the Middletown Half Marathon as the race is expected to sell out.